Right now our house is filled with pregame excitement and the heavenly smell of apples and cinnamon. 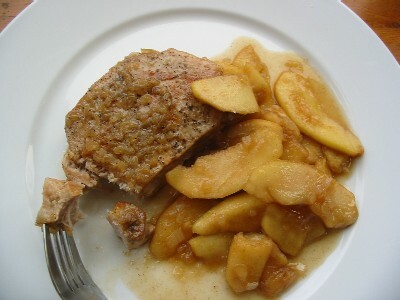 Today we’re having boneless medallions in a white wine sauce, served with sauteed shallots and apples. 100% Salt Free AND Deeeeeelicious. The recipe below serves 4 – leaving room for today’s main dish: EAGLES v. BEARS, 4:15 pm. Go, BIRDS!! Sprinkle both sides of chops lightly with freshly ground black pepper. Heat oil over high in a large saute or frying pan. Once oil is hot, place chops in pan and brown quickly on both sides, about 2 minutes per side. Remove from pan and transfer to a baking dish. Reduce heat to medium. Add shallots to pan and cook, stirring, 2-3 minutes, scraping pan to remove drippings. Add wine and pepper and stir. Cook another 5-7 minutes, then pour over chops. Cover casserole with aluminum foil, place on middle rack in oven and bake 45 minutes, or until internal temperature reads 160 degrees. To prepare the apples, melt butter in a large saute pan over medium heat. Add shallots and saute 2-3 minutes. Add remaining ingredients and cook, stirring, 10-15 minutes, until apples are tender and liquid reduced.